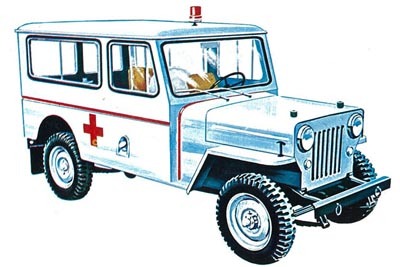 Willys Ambulances were built on various different chassis and engine combinations, and received their own serial number ranges starting in 1955. 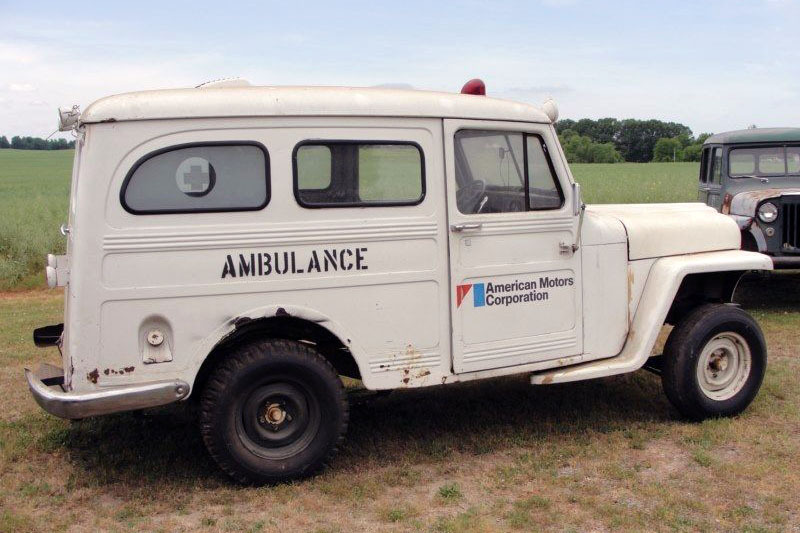 The four-wheel-drive 6-226 Willys Ambulance (left) came with four stretchers, roof ventilator and folding rear step. The six-cylinder Super Hurricane engine was standard, and the four-cylinder Hurricane was optional. See a rear view (120K JPEG) from the Jeep Specialized Vehicles and Equipment catalogue. 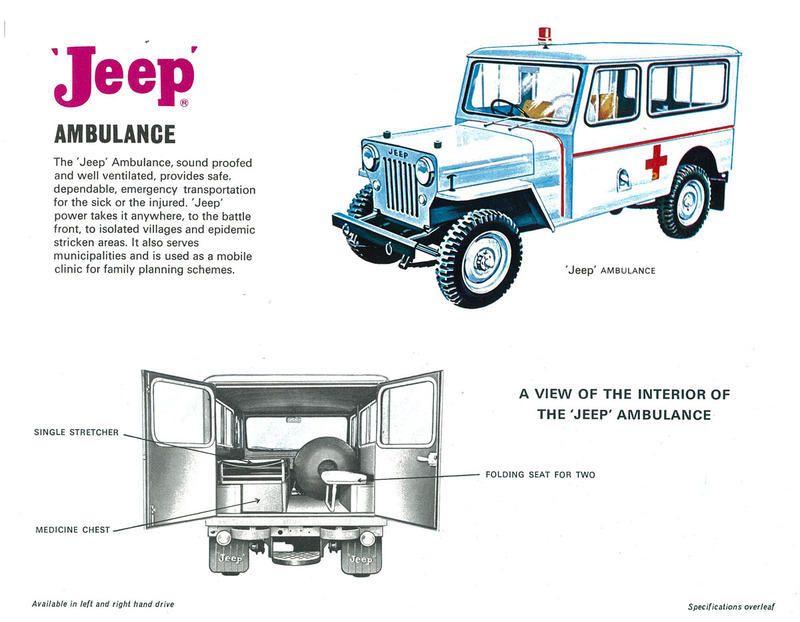 See a Willys brochure (50K JPEG).The ambulance is also seen in use in the publication Jeeps in Public Service. 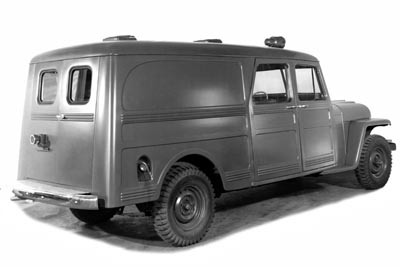 The factory 4x4 "Utility Ambulance" used the standard Sedan Delivery body with roof vent added, and brackets installed to support two standard army stretchers. See a Willys brochure (50K JPEG). 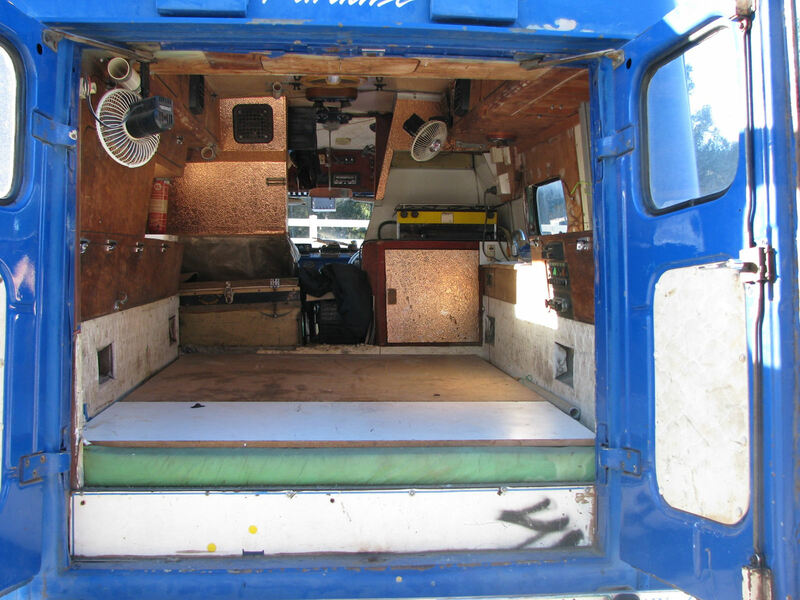 A rear view with doors open (90K JPEG) reveals the pretty spartan and cramped interior. 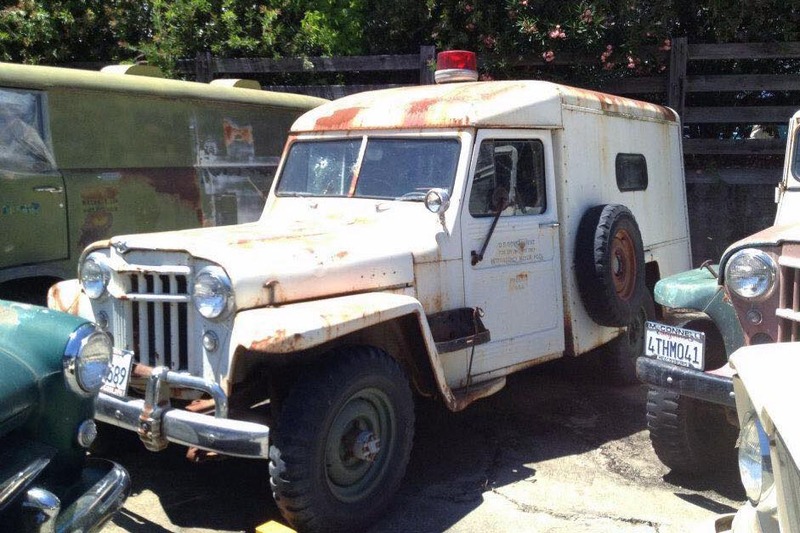 This unit was reportedly kept for use at the Willys plant in Toledo, apparently until at least 1970 when AMC purchased Kaiser Jeep. It was the "Deluxe" version, based on the Station Wagon body with rear side windows. 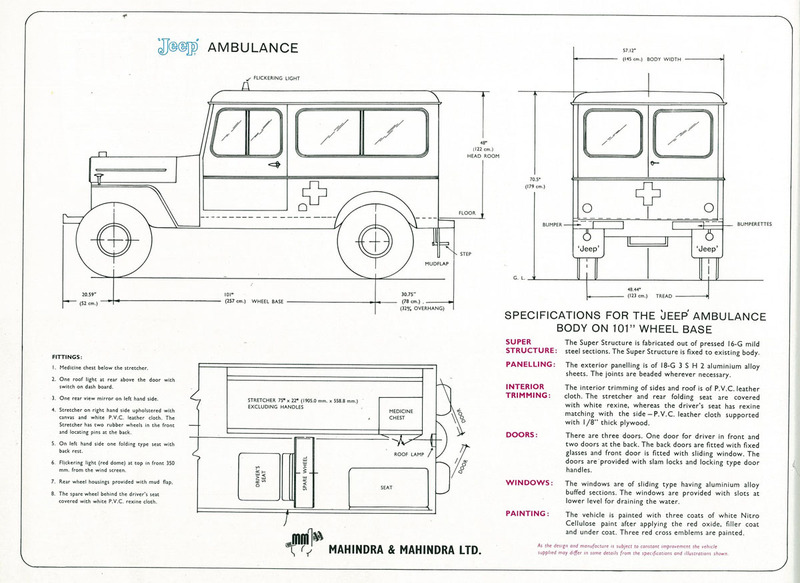 See more photos and specs of this and the large 6-226 ambulance, in the Jeep Specialized Vehicles and Equipment catalogue. 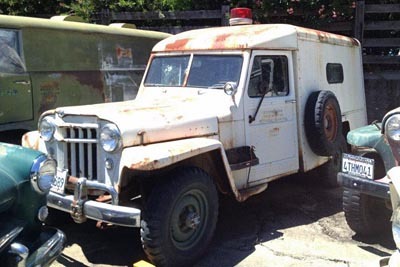 This US Government surplus field ambulance is in the collection of Willys America in California. 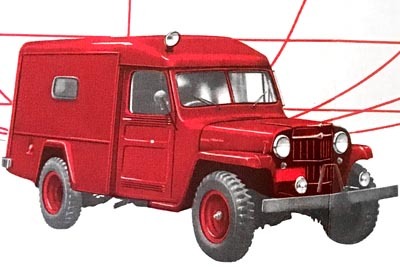 See also their Willys Light Duty Rescue Truck. Another photo (80K JPEG) shows the original lettering "Emergency Ambulance for the people of the Netherlands." Willys also donated an ambulance to support agricultural reform in Cuba, at a 1959 training course in Havana (90K JPEG). 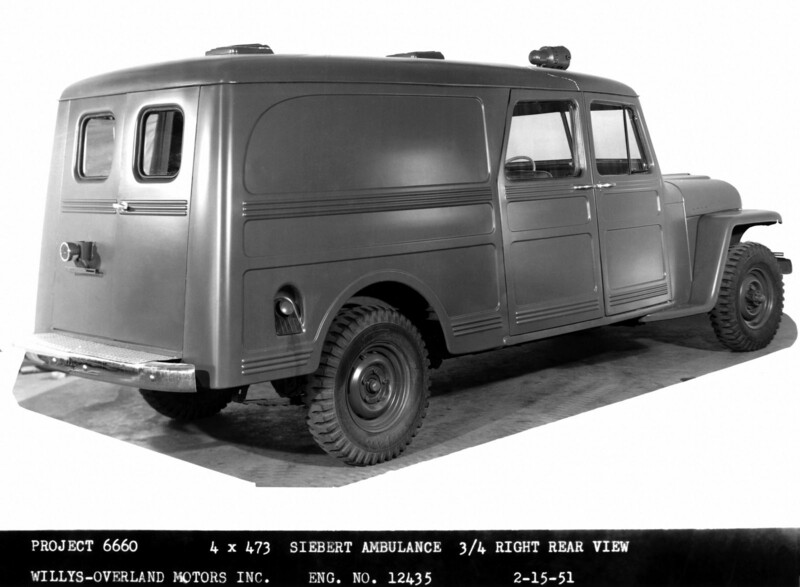 To develop an ambulance with more length in the rear, a panel delivery built on a longer wheelbase was sent out to Shop of Siebert, "quality coach craftsmen since 1853." The prototype was still under Willys Engineering Project 6660 when it was photographed on 1 March 1951. See also a front view (230K JPEG). Siebert was located at 614 Southard Avenue in Toledo, and someone was apparently a bit sloppy when they put gas in the new ambulance to drive it back to the Willys plant. 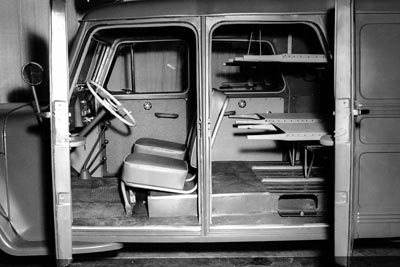 This photo reveals that the 1951 four-door prototype was capable of carrying four stretchers behind the two front seats. 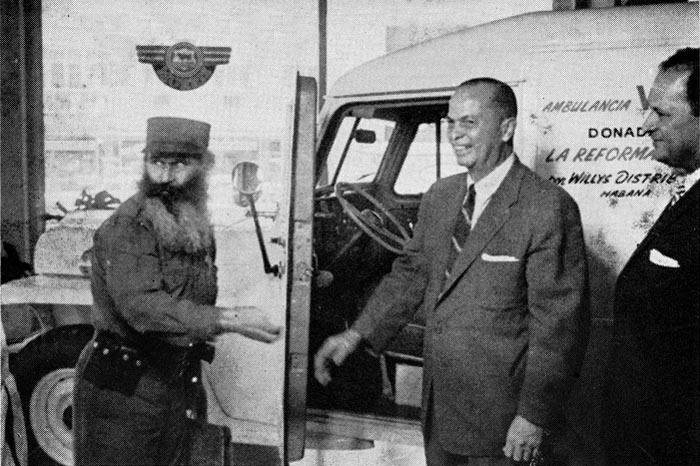 The second set of doors was switched between left and right, allowing them to swing to the rear. A Siebert ad for the "Willys S.O.S. Ambulance" calls it "America's most versatile low cost ambulance." See the full page ad (110K JPEG) found by Bill Norris. 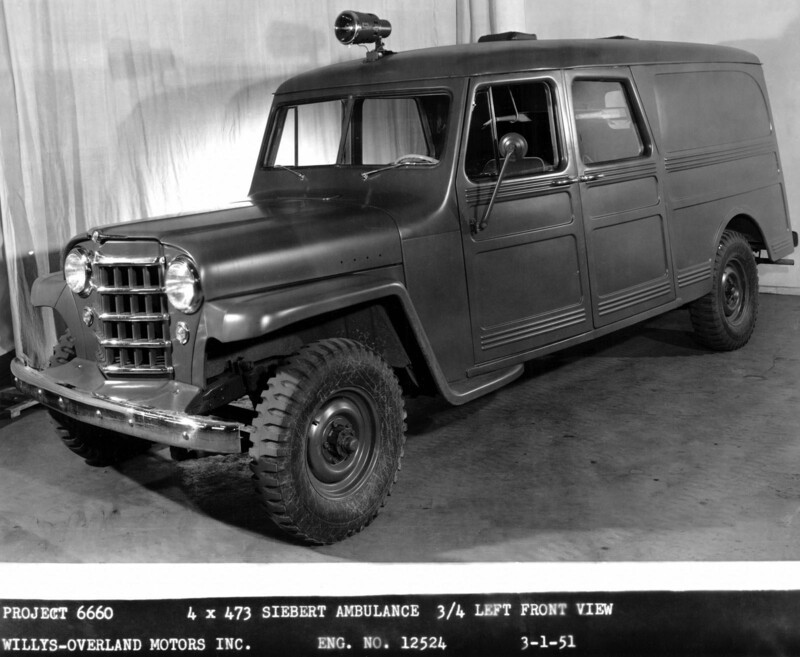 Siebert also built ambulances on Ford and other platforms, and apparently the Willys did not sell well. 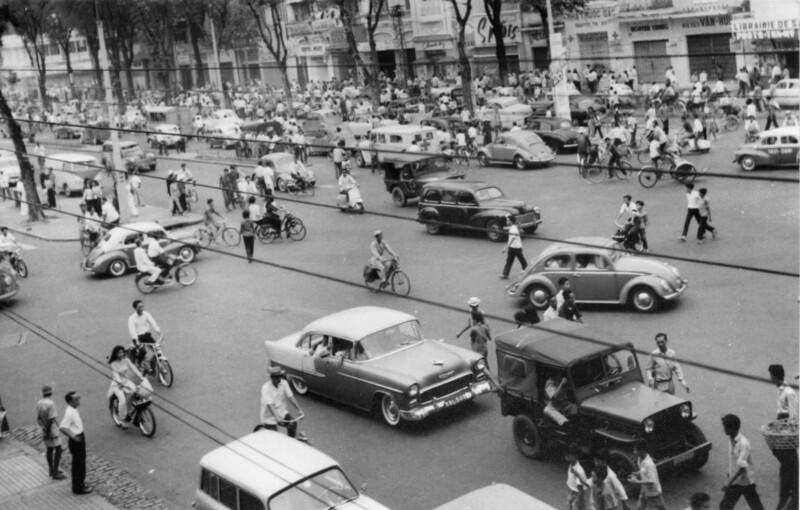 The only place I've seen a photo of a Siebert Willys in service, is in the background of a 1963 Saigon street scene (210K JPEG) from the George Krizansky Collection of the Virtual Vietnam Archive. 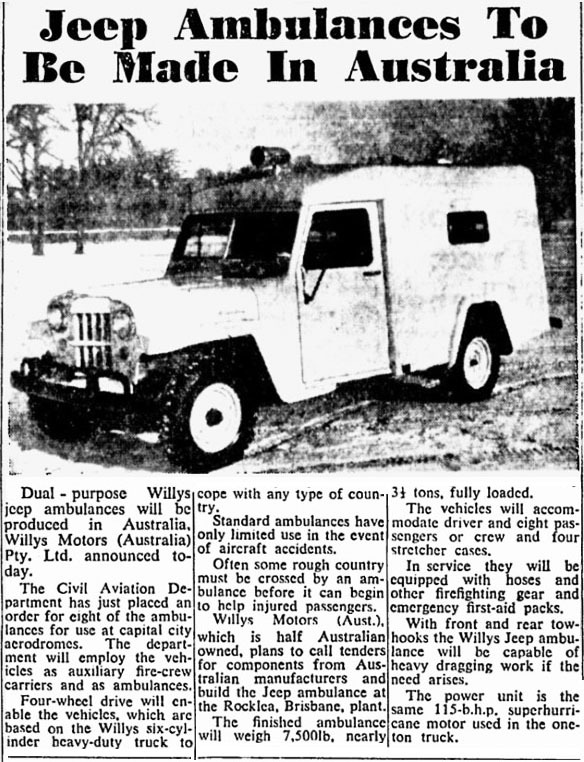 This article ( Sydney Morning Herald , 18 June 1959) announced that the Willys Ambulance would be built built at the Willys Motors plant in Brisbane, using some Australian components. The government had ordered eight of the vehicles as crash rescue trucks at airports. They would carry four stretcher cases, or eight fire crew as passengers. The article also states that, "In service they will be equipped with hoses and other firefighting gear and emergency first aid packs. The finished ambulance will weigh 7,500 lb., nearly 3-1/2 tons, fully loaded." 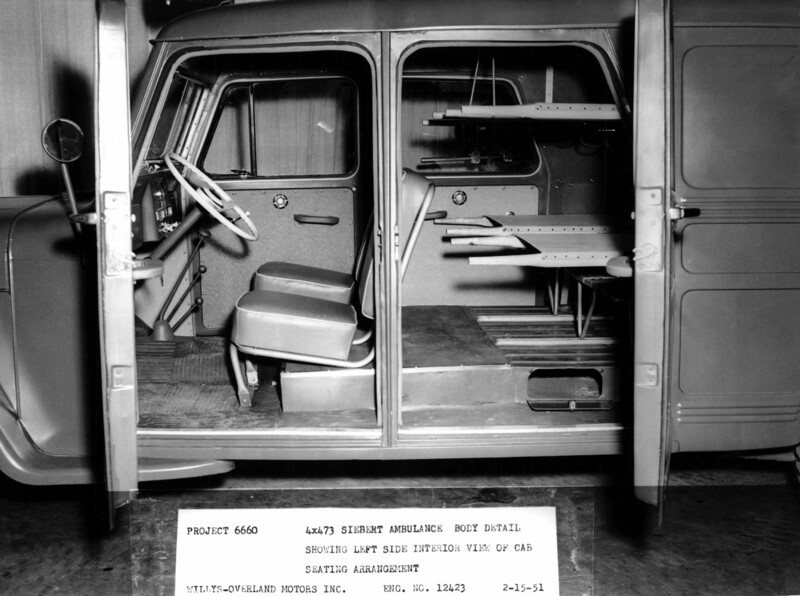 Vaughn Becker says, "My understanding was they all came over CKD as cab/chassis and were assembled in Brisbane and the ambulance body built and installed by either Athol Hedges or Superior Body Works, both Brisbane firms." 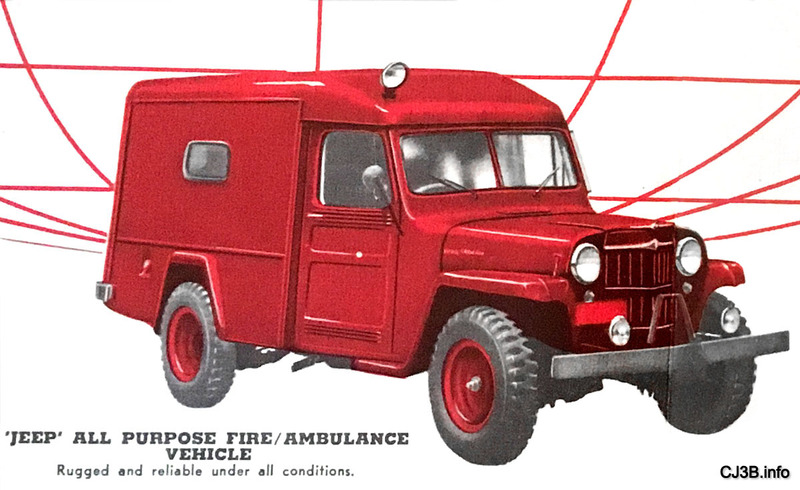 Willys Australia showed the truck painted red in a brochure (310K JPEG), and called it an "all-purpose fire/ambulance vehicle," even though it was not equipped in any way as a piece of fire apparatus. I wondered what the "A"-shaped bracket on the front bumper was for, until I saw a photo of one of these red units in service (50K JPEG) at Moorabbin Airport near Melbourne, with a bell mounted there. Photo courtesy of Tim Lovelock. It's not clear if more than the eight ambulances ordered by the government might have been built, but it seems likely because as of 2018 there are quite a few survivors. 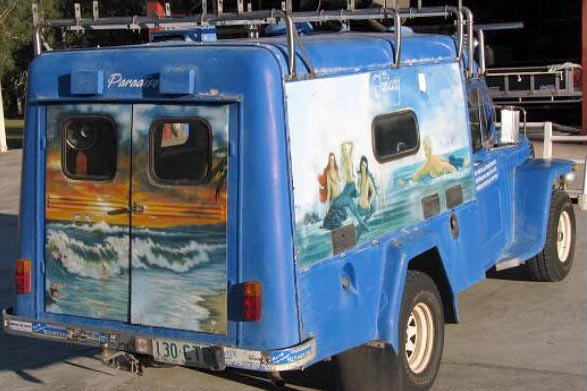 This one in Brisbane has been converted into a camper. See also a rear view and the interior (40K JPEGs). Photos courtesy Mark Hammond. 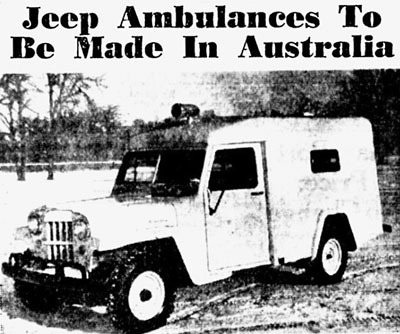 Although Willys sold ambulances around the world through its export division, and right-hand-drive was offered as an option, Australia had the manufacturing capacity to build this kind of vehicle locally, allowing the units to be designed to local specifications. This unit was built on a 1953 Willys truck chassis by W.S. Grice Motor Body Works in the Sydney suburb of Summer Hill, and purchased by Bourke District in New South Wales. 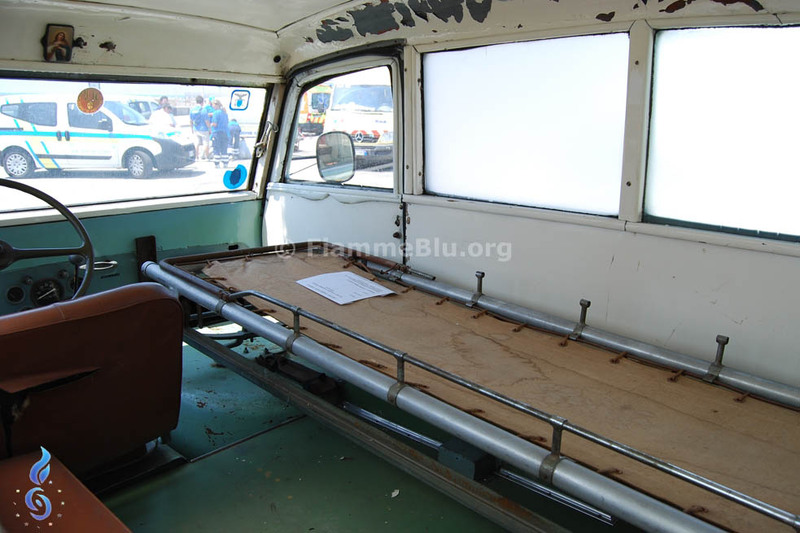 Grice specialised in ambulances and hearses, built on many different chassis from the late 1920s to the 1970s. 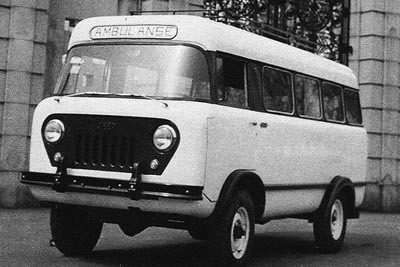 This undated photo courtesy of Paul McCurley shows the vehicle in its original light chocolate brown finish, lettered for Bourke District Ambulance. Paul McCurley also provided some background: "Prior to 1972, ambulance services in the state were controlled by the NSW Ambulance Transport Service Board. If a region wanted to start a service in their community, they formed a District Committee that was overseen by the Board. The Committee was responsible for their own fleet of vehicles. This led to a wide variety of vehicles and conversions being used across the state. 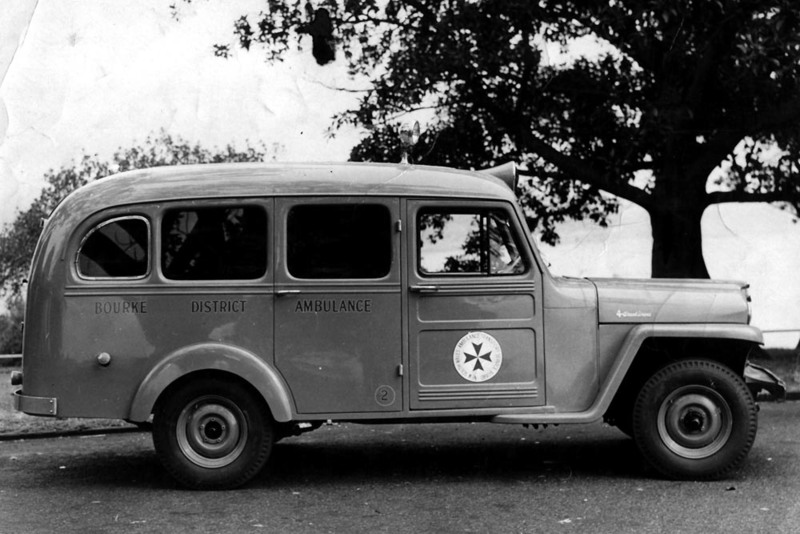 At the time the Bourke District Willys was built, it is believed to have been the only 4WD ambulance in operation in NSW, and was one of only seven similar models built by W.S. Grice. Ted Robinette took this photo of the vehicle after it was painted by former owners Noelle and Eddy Reynolds of Melbourne, and he says, "Grice had a contract to build six for use in Malaysia, and the seventh was built for the Ambulance Service in NSW. They had heard of the Malaysian contract and needed a 4WD to negotiate the terrain 'back of Bourke'. It could carry five patients with three on stretchers and two sitting." Note the recessed spare tire on the left side. See also a rear view photo (70K JPEG) of this unique vehicle, showing the extra door on the side behind the right-hand-driver's position. The Bourke Willys is now in the collection of the Ambulance Victoria Museum in Bayswater, Victoria. As of 2018 it is reportedly being repainted in cream. 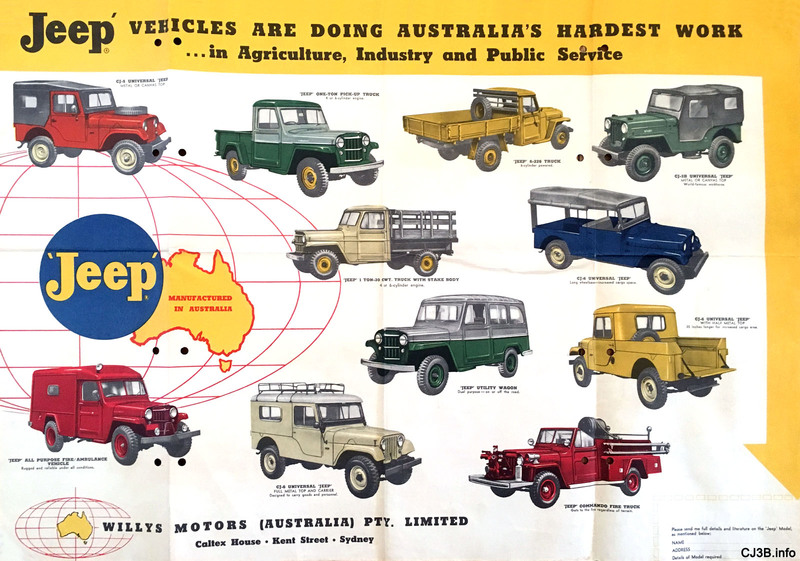 Vaughn Becker says that most of the over one thousand 6-226 4x4 units produced by Willys in Brisbane, Australia from 1958-68 (see Jeeps in Australia) were in fact the cab/chassis version rather than the complete station wagon. Another ambulance built on this platform is shown in this photo as delivered to Barcaldine Hospital in Queensland. It follows the general style of the U.S. factory version but has differences including a side entry door in the rear body. 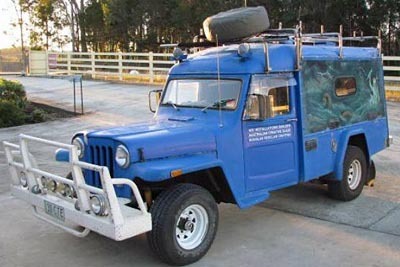 See also the Q Van FC-170 rescue truck in Sydney, and a long-wheelbase CJ-3B Australian Army Ambulance on CJ3B.info. 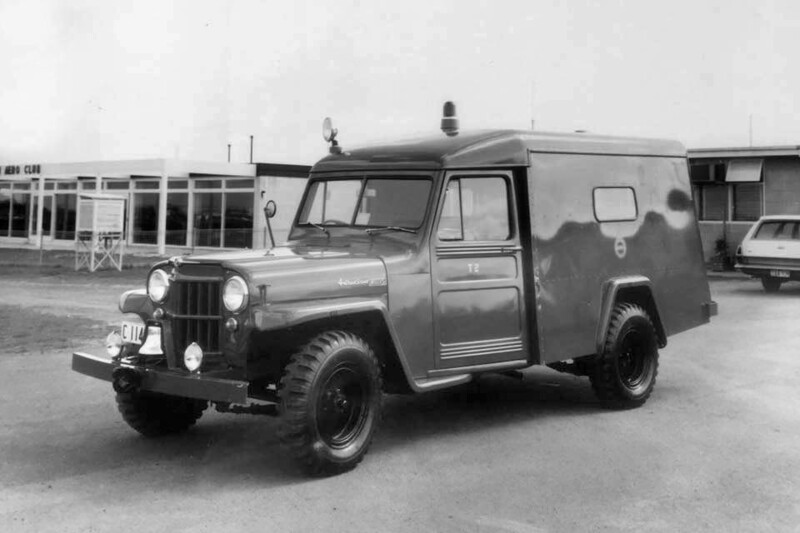 Forward Control Jeeps were popular as fire and rescue vehicles in countries including Australia, Switzerland and the U.S., but for some reason FC ambulance conversions were less common. 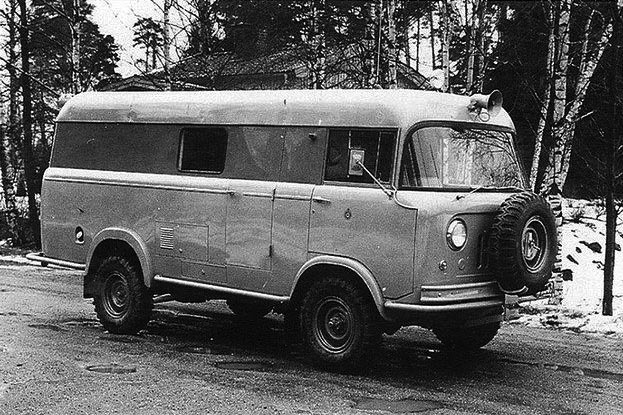 I ran across this "ambulanse" and another FC-170 van conversion (120K JPEG) in The Jeep in Sweden by Stig Edqvist. 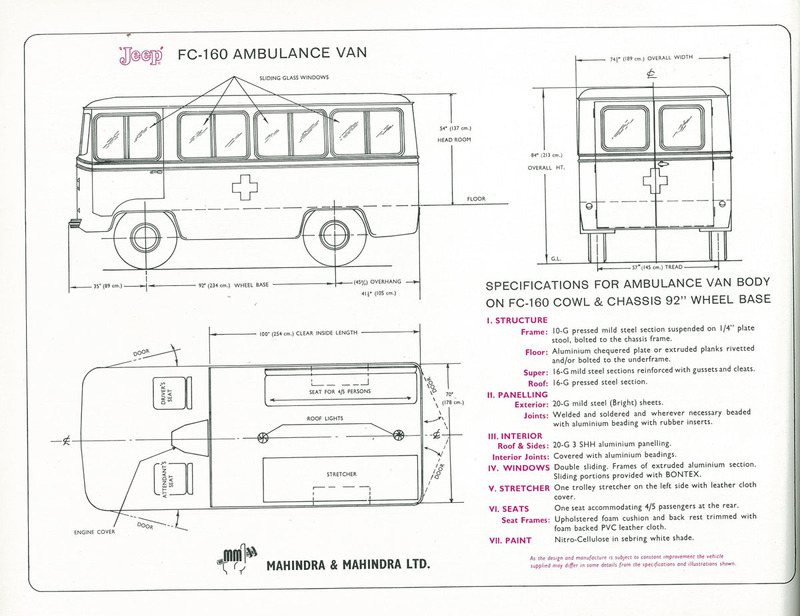 A 1972 catalogue showing the full range of Jeep vehicles built by Mahindra & Mahindra in India, includes two ambulances. 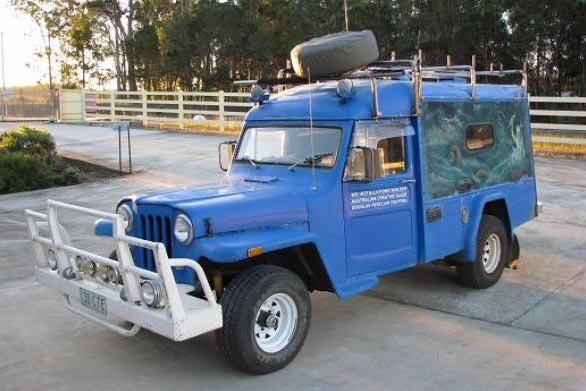 The page (200K JPEG) showing this single-stretcher unit based on Mahindra's "CJ-4" long-wheelbase Universal Jeep, also includes a rear view of the interior. The following page of specifications (200K JPEG) includes elevations and plan-view drawings. 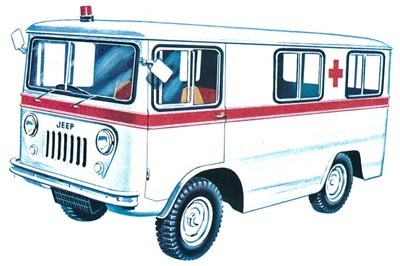 I photographed one of these ambulances in 1990 in northern India -- see Jeeps of Ladakh on CJ3B.info. 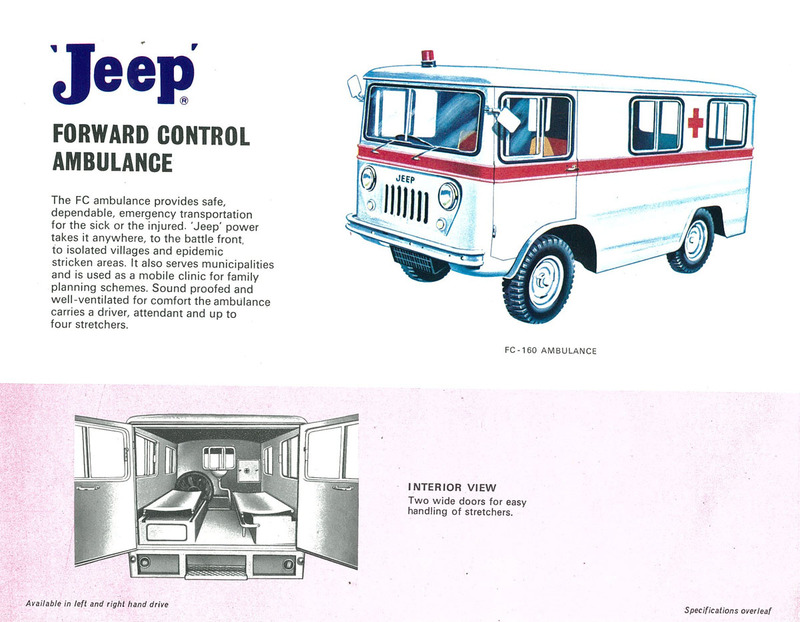 Mahindra also advertised the Jeep Forward Control Ambulance (220K JPEG) based on their FC-160 van. Like the CJ-4 above, the FC was available in left or right-hand-drive, with varying interior arrangements carrying from 1-4 stretchers. Again there is also a specifications page (200 K JPEG). 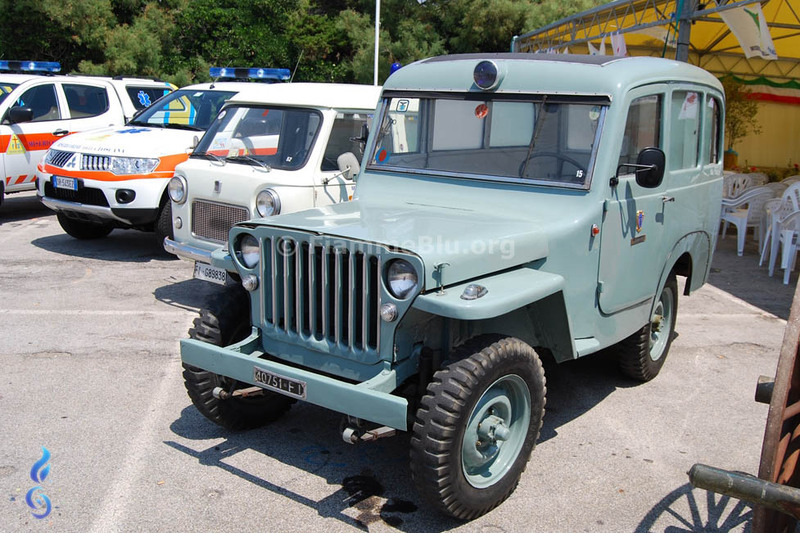 See more vehicles from this catalogue of Mahindra's 1972 Jeeps. 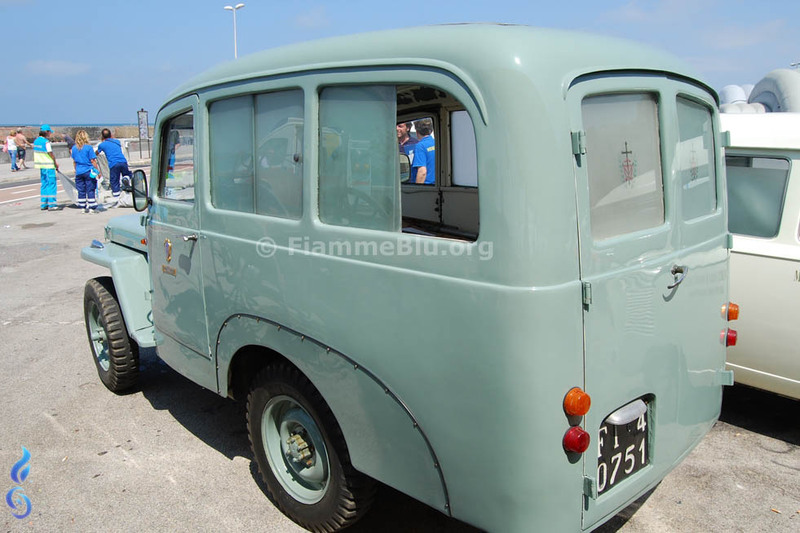 This conversion of a Spanish VIASA Jeep, by Sirecom of La Spezia, Italy, used a short-wheelbase Jeep, but installed an extended hardtop to accommodate a stretcher. This photo is by Ambu, from Fiamme Blu. 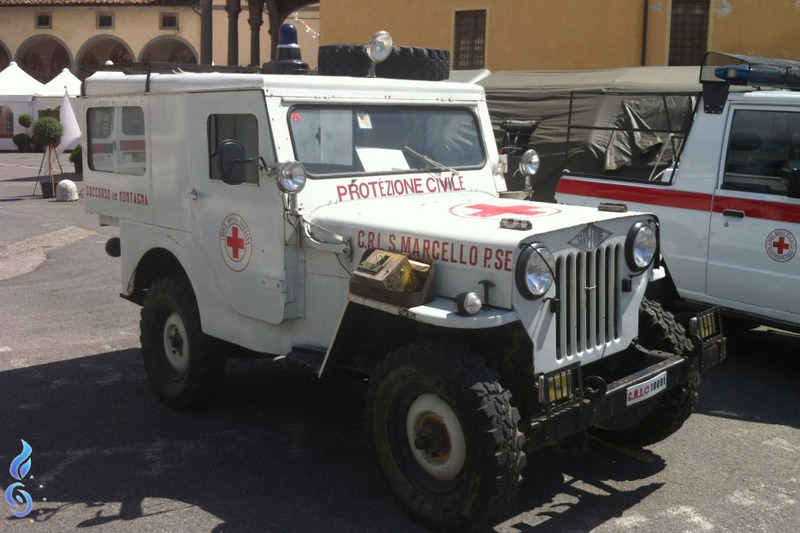 See more details on this San Marcello Mountain Rescue Jeep on CJ3B.info. 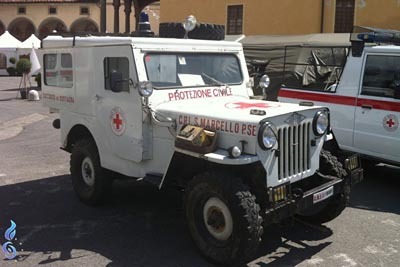 A beautifully-built ambulance body on a World War II surplus jeep, was used by Misericordia di Prato, a religious organization providing health services in Prato, Italy. See also a rear view (100K JPEG) and the interior (100K JPEG). I have no details on where this conversion was done. The photos from Fiamme Blu are by Alberto Di Grazia. 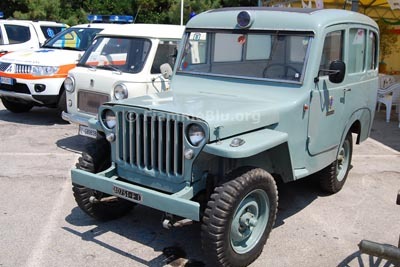 See Willys Military Ambulances and the Kaiser M725 Military Ambulance. Also on CJ3B.info, see newer Jeep Ambulances. 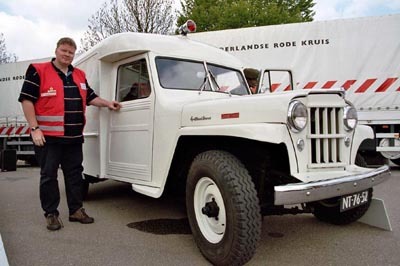 Return to Fire Service Jeeps.